The techniques of natural language processing (NLP) have been widely applied in machine translation and automated message understanding, but have only recently been utilized in second language teaching. This book offers both an argument for and a critical examination of this new application, with an examination of how systems may be designed to exploit the power of NLP, accomodate its limitations, and minimize its risks. This volume marks the first collection of work in the U.S. and Canada that incorporates advanced human language technologies into language tutoring systems, covering languages as diverse as Arabic, Spanish, Japanese, and English. * What can current NLP technology contribute to computer-assisted language instruction and to research on language learning? * How can this technology meet the demands of pedagogical theory for communicative language teaching in authentic contexts? * How can designers constrain tutoring environments to ensure accurate analysis of learners' language? * What can NLP-based systems teach us about language acquisition, about linguistic theory, and about theories of language pedagogy? * What lessons have been learned in using these systems to date? 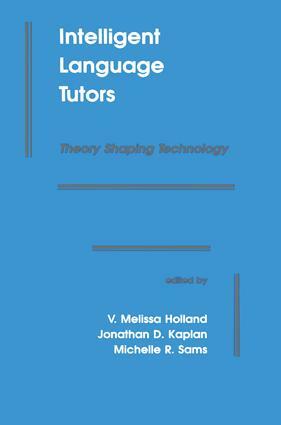 Discipline-specific issues are illuminated as well: the relative merits of the major syntactic frameworks for NLP-based language tutoring; the adaptation of theories like lexical conceptual structure to support semantic interpretation; the integration of input language with visual microworlds and dialogue games; the pragmatics of the tutoring discourse; the selection of instructional principles to guide system design; and the accomodation of design to individual differences and learner styles. A concluding section assesses this work from larger theoretical and practical perspectives -- experimental psychology and psycholinguistics, linguistics, language teaching, and second language acquisition research.